“As scientific knowledge advances and societal views evolve, the clinical use of germline editing should be revisited on a regular basis” 2015 organizing committee of the First International Summit on Human Genome Editing. And here we are at the end of 2018, ‘revisiting’ this for real. 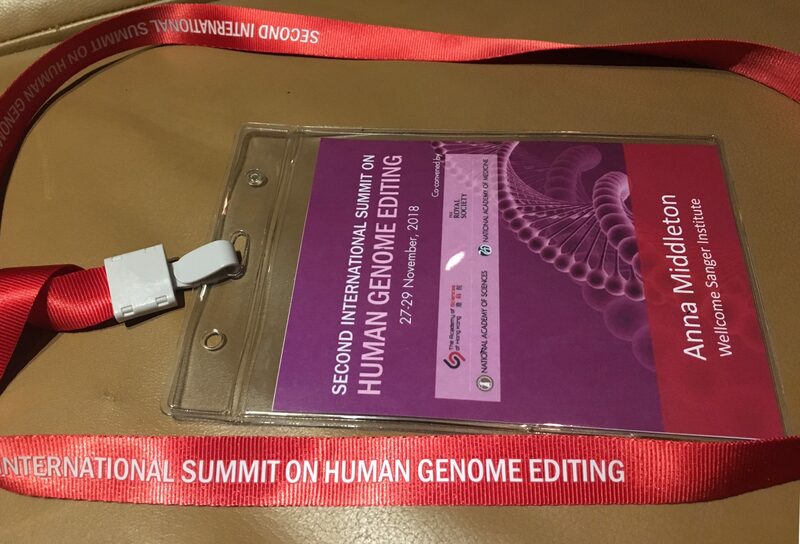 I’m writing this while sitting in the audience in Hong Kong at the Second International Summit on Human Genome Editing, funded by the Royal Society, National Academy of Sciences, National Academy of Medicine and the University of Hong Kong. As an invited presenter on the public responses to genomics I’m excited to be sitting amongst the world elite from science, medicine and ethics. The first thing that strikes me is the overwhelming presence of media in the auditorium, all excited by the announcement yesterday of the ‘first’ edited embryos to have been born, apparently delivered a few weeks ago. The veracity of this is still very much a topic of debate across the media and scientific establishment. There are many gaps and unusual elements to the announcement that call for caution and further detail. But in the busy coffee breaks, the chat focuses on the ‘disbelief and horror’, and ‘how did he manage to do this without ethical regulation?’ There is concern in the air about the ‘ease’ with which the scientist could persuade a series of patients undergoing IVF to allow him to edit their healthy embryos. Prof He Jiankui, an associate professor at a Shenzhen university (https://theconversation.com/rogue-science-strikes-again-the-case-of-the-first-gene-edited-babies-107684) claims to have edited a single gene that may offer some level of protection against future HIV infection. The implanting of an edited embryo with the deliberate intent to lead to a pregnancy, is currently illegal in many countries. A change in the law is not going to happen any time soon, but I guess that may give time for the scientific research and ethical enquiry to reach some level of consensus on what could and should be offered. The problem is that the consensus doesn’t exist yet, although the announcement is uniting the scientific community in opposition and disbelief. What seems to be generally agreed amongst the audience of delegates at this Summit is that the science just isn’t there yet to guarantee that there would be no downstream effects of editing one gene and either inadvertently editing another at the same time, or causing a disruption of an unexpected pathway leading to the creation of disease. So, what cannot be guaranteed is that these newly edited children won’t be susceptible to other serious health problems. We are reassured by Prof He that he will cover the medical bills for these children up to the age of 18, what a charitable soul! Whilst the future of these children hangs perilously in a sense of disbelief the audience are asked to take stock. Prof George Daly, from Harvard Medical School reassures us that the current ‘mishap’ should not put us off striving for delivering the best science together with ethical frameworks to offer oversight of embryo editing. He asserts: ‘we need a well-defined translational pathway’ so that we can offer embryo editing clinically. In support of this the Nuffield Council on Bioethics have previously reported in ‘Genome Editing and human reproduction report’ (July 2018): ‘We can, indeed, envisage circumstances in which heritable genome editing interventions SHOULD be permitted’. The audience is seemingly reassured that embryo editing is on the horizon, but just not yet, and certainly not for the enhancement of perfectly healthy embryos (as per the Chinese case). When Prof Daly was asked ‘but there are other clinical pathways that could be used instead of embryo editing, what about pre-implantation genetic diagnosis?’ He replies that he envisions in the future that embryo editing will be easier than PGD; and editing of gametes before fertilisation will become a reality, thus both of these may become the treatment of choice. So there we have it. At this Summit on Genome Editing, we appear to be heading towards a future where we WILL be delivering editing of embryos in clinical practice to patients and families. At the Summit we hear impassioned calls from patient groups, for example, the Sickle Cell Disease Community who are embracing genome editing, primarily in somatic testing, but not ruling out in embryos. There are repeated calls from the audience for ‘consensus’ and ‘acceptability’ from the public. These calls are fleetingly mentioned without real thought or understanding of just how hard this is to do. With an average reading age of 10 in the UK and 85 per cent of people having never heard of the word ‘genome’ before, we have a long way to go to socialise this enough to enable meaningful debate. That’s not to say we shouldn’t do it, we absolutely should, but instead of just imagining this happens by osmosis, we should adequately value, resource and support the communication research to enable this to happen appropriately. The question of if this is fact or fiction will become clear in coming days. What is clear is that there is an urgent need for the community to reach some conclusions on the issues raised. And clearly the clock is ticking.